» Reload / return to the main page. » Send me an email. I try to reply to most questions. I no longer answer "How much is my camera worth?" inquiries, because it's very difficult to know without seeing the camera and knowing its condition. Check eBay's closed auctions for an average price range. This Retina was among the first to use a lever film advance. 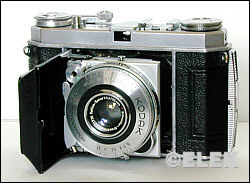 Unlike later folding Retinas, the lever was on the top of the camera. The camera had grown from its previous versions. Though still pocketable, the front protruded more than before, with the lens door featuring squared corners. The Retina Ia is a zone-focus camera, which means you guess the distance from subject to camera. The smaller maximum aperture helped to compensate for some guessing errors on distance, although if you have a separate rangefinder, that works best. The Retina continued the tradition of using the time-tested uncoated f/3.5 Schneider-Kreuznach Xenar set in a Synchro-Compur shutter, which now permitted the user to switch between bulb and electronic flash synchronization. It's a pleasant camera and pocketable, although the door when open takes up a bit more room than I would like, leaving precious little room for gripping the camera with your right hand.